The perfect, easy-to-carve holiday ham. Whether you call it a holiday ham or Sunday dinner, the unrivaled flavor of our Boneless Hickory Smoked Ham is reason enough to celebrate. We start by brining our hams with high-quality ingredient like the finest premium brown sugar. Then, they’re smoked for hours with natural hickory wood in our smokehouse. Our boneless hams are available in three sizes to accommodate any number of guests. And, since we use only whole-muscle hams and never add fillers, binders or MSG, you can feel good about serving our naturally hickory smoked, gluten-free hams. Preheat conventional oven to 350°F. Place fully cooked boneless ham on a rack inside of a deep, oven-safe cooking pan. Fill bottom of pan with 3-4 cups of water. Tightly cover ham with aluminum foil. Heat ham to an internal temperature of 145°F. Approximately 15 minutes per pound. Discard aluminum foil and add Brown Sugar Glaze if desired. Heat for additional 30 minutes at 350°F with glaze. The Whole Family Ham contains approximately 40 servings. The Dainty Ham serving size varies. 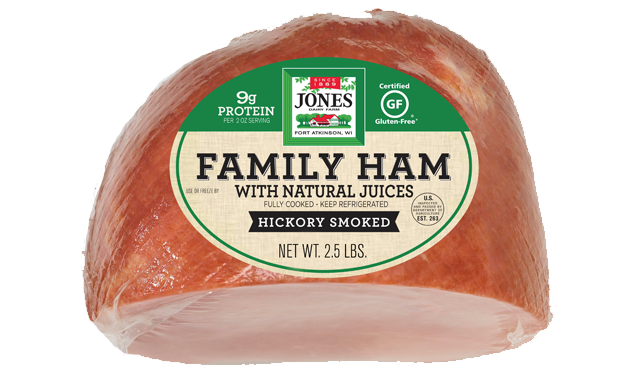 Per 3 oz serving, the Dainty Ham contains 100 calories (40 from fat), 4g fat, 1g Sat. Fat, 50mg Choesterol, 760mg sodium, 1g sugar and 15g protein.